Several BOA members (including your Webmaster) attended the IAO Annual Congress based in Durham earlier this year, and many of the instruments visited will feature here over the next few months. One of the highlights was a visit to St Mary's Cathedral in Newcastle, where we heard the completely new organ built during the previous year by Kenneth Tickell & Co. Sadly, our visit there coincided with the announcement of the death of Ken Tickell, aged only 57, a great and premature loss to the world of organ-building. BOA members will remember visiting his Northampton workshop in 2012 during the construction of this large mechanical-action instrument. 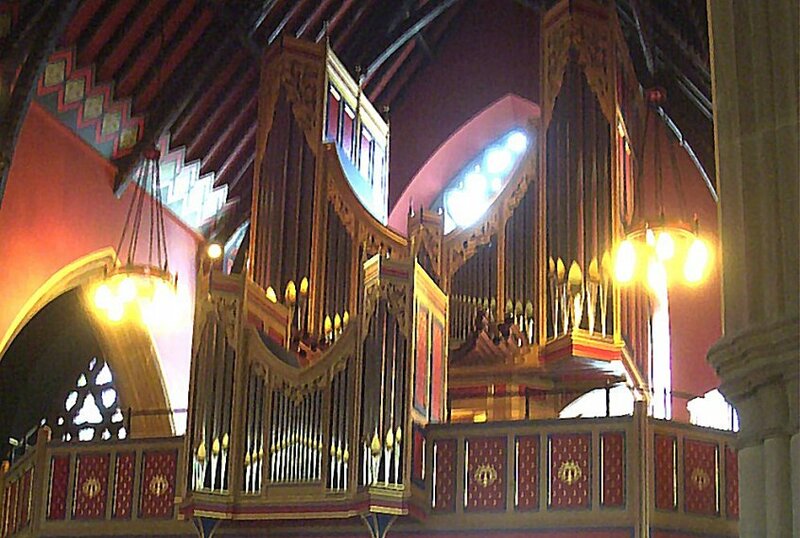 The organ, dedicated on 9th February 2013, stands on a west-end gallery and is housed in a double case dramatically decorated in red & blue, complete with a rank of horizontal Chamade pipes (see central photo) projecting from it. 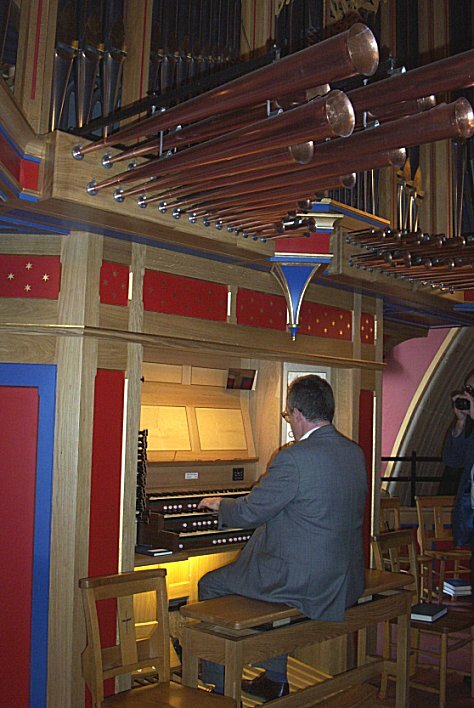 The Choir Organ is positioned behind the player in a separate case overhanging the gallery, following the continental style. The recital focussed on early music (de Grigny, Buxtehude and Bruhns), but also included a piece by Reger and an improvisation, all played by Tudor music specialist Magnus Williamson. The organ was certainly effective in this repertoire, with boldly-voiced mutations & mixtures appropriate for the Baroque and the Swell strings imparting a more Romantic character. 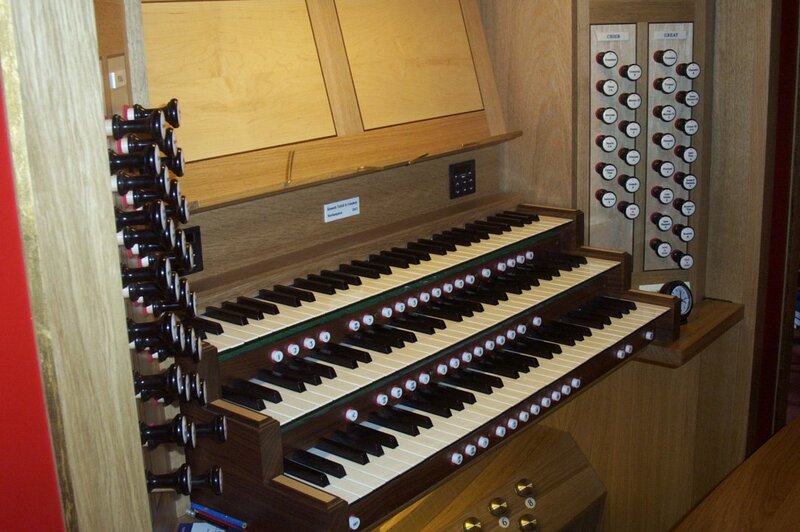 The instrument is a fitting memorial to the work of its builder.